Catelyn still remembered the innkeep, a fat woman named Masha Heddle who chewed sourleaf night and day and seemed to have an endless supply of smiles and sweet cakes for the children. 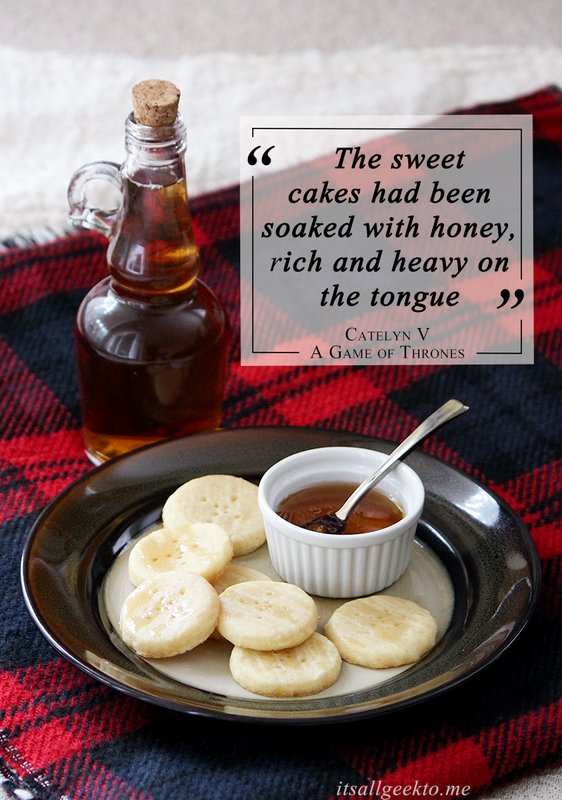 The sweet cakes had been soaked with honey, rich and heavy on the tongue, but how Catelyn had dreaded those smiles. My re-read of A Game of Thrones last year added many new recipes ideas to my "to-do" list. This one topped the list, because who doesn't love honey? I poked around various medieval recipe sites to see if "sweet cakes" referred to any sort of dish in particular, but this might have been a George R.R. Martin creation. 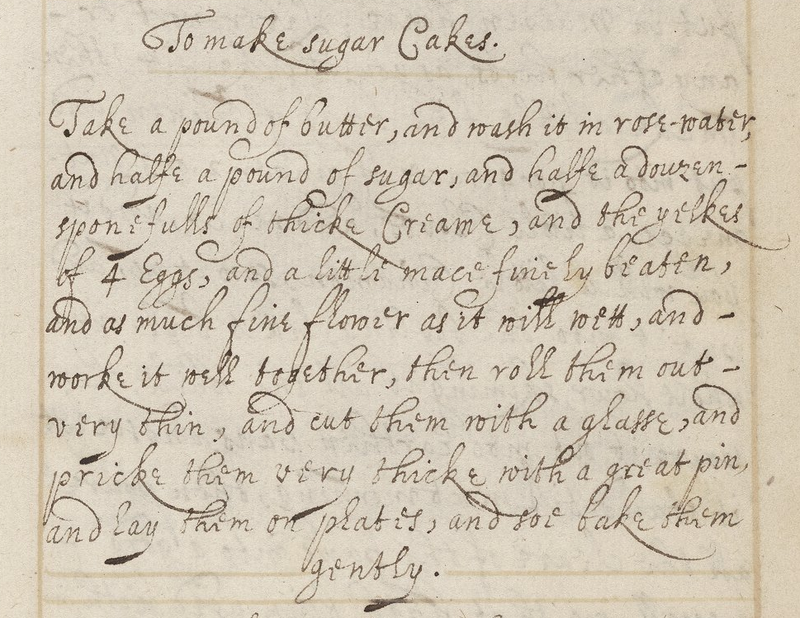 In the end, I selected this recipe from the Receipt Book of Sarah Longe, a beautifully penned cookbook dated to around 1610, because "sugar cakes" seemed to be about as close to "sweet cakes" as I could get. Take a pound of butter, and wash it in rose water, and halfe a pound of sugar, and halfe a douzen sponefulls of thicke Creame, and the yolkes of 4 Eggs, and a little mace, finely beaten, and as much fine flower as it will wett, and work it well together, then roll them out very thin, and cut then with a glasse, and pricke them very thicke with a great pin, and lay them on plates and soe bake them gently. 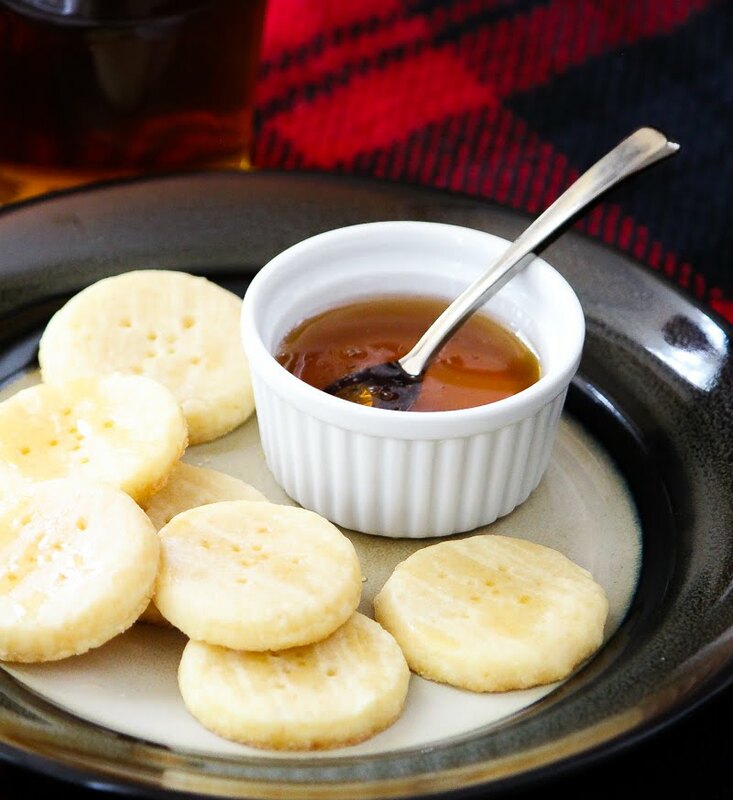 This recipe produces a soft, buttery cookie that is only lightly sweetened, making it perfect for soaking with honey à la Marsha Higgle. Since Sarah Longe's recipes are typically intended for entire households, I scaled the recipe down to a more modern size. I also replaced a quarter of the sugar with honey. Finally, I omitted the rose water washing stage; commercially available butter has already been washed. If you are devoted enough to use homemade butter for your medieval cooking, perhaps add a few drops of rosewater to your wash step! Preheat oven to 350°F. Cover a cookie sheet with parchment paper. Cream together the butter, sugar, honey and cream. Sarah Longe would not have had an electric hand mixer, but it makes this task considerably quicker. Stir in the egg yolk and mace, then combine with the flour, one half-cup at a time. Lightly flour a rolling pin and a counter top or cutting board. Roll out the dough to 1/2 inch thick. For full authenticity, find a small glass or a shot glass to cut the cookies. Dip the rim in flour and press upside-down into the dough, swirling the glass slightly to release the dough. Place the cookie on the cookie sheet. Repeat, flouring the glass between each cookie to prevent sticking, and space the cookies well on the cookie sheet. With the tines of a fork, prick each cookie twice to create a cross shape, wiggling the fork gently to make slightly larger holes. Bake the cookies for 6 minutes, or until the bottoms are golden. Transfer to a wire rack to cool. Place the rack over a sheet of parchment paper. Liberally drizzle honey over the cookies, moving your hand quickly back and forth to produce many thin streaks of honey. Serve with iced tea, sweetened with honey to taste. For a truly decadent Game of Thrones Tea Party, arrange on a platter with Sansa's favorite lemon cakes! I love that you adapted a 400-year-old recipe for these sweet cakes! That's so perfect, and they look amazing!